I've been wanting to have a fast-food in game forever, and since I know now a bit more about custom food creation (thanks to my dear friend MunMun! ), I finally can offer you this McDonald's, that we can "McDo" in french, thus the name of the set. 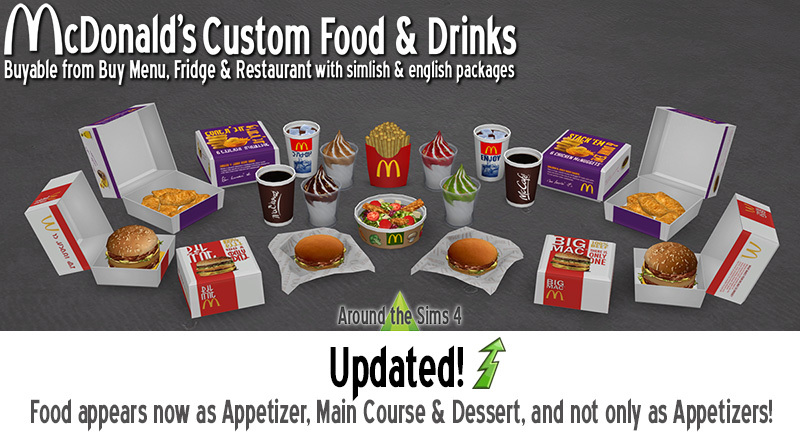 The food and and drinks can be bought from the Buy catalog under Appliances/Misc, but also from the fridge or from restaurant if you have Custom Food Interactions (minimum version 3.7) and Custom Drink Interactions (minimum version 2.5) mods. Food and drinks come with their own custom packaging instead to replace plates & glasses. There's no custom thumbnails on these. Well, if you are indeed happy with this set, don't forget to support the site if you can, so you'll push me at making more! Thank you! Ces plats et boissons peuvent être directement achetés depuis le mode Achat, au catalogue Electro-ménager/Divers. Vous pouvez aussi acheter ces plats et boissons depuis le frigo et les restaurants si vous avez les mods Custom Food Interactions (version 3.7 minimum) et Custom Drink Interactions (version 2.5 minimum). Plats et boissons ont leurs propres emballages (cartons, gobelets) qui remplacent les traditionnels verre et assiette. Attention, il n'y a pas de vignette personnalisée sur ces objets. Si vous êtes effectivement heureux de ce set, n'oubliez pas que vous pouvez soutenir le site pour m'encourager! Merci! These meals and drinks can be bought directly from the Buy catalog under Appliances/Misc. You can also buy them from the fridge or from restaurant if you have Custom Food Interactions (minimum version 3.7) and Custom Drink Interactions (minimum version 2.5) mods. Vous pouvez aussi acheter ces plats et boissons depuis le frigo et les restaurants si vous avez les mods Custom Food Interactions (version 3.7 minimum) et Custom Drink Interactions(version 2.5 minimum).